gives a list of vertex degrees for the vertices in the underlying simple graph of g.
gives a list of vertex in-degrees. gives a list of vertex out-degrees. DegreeCentrality will give high centralities to vertices that have high vertex degrees. The vertex degree for a vertex is the number of edges incident to . For a directed graph, the in-degree is the number of incoming edges and the out-degree is the number of outgoing edges. For an undirected graph, in-degree and out-degree coincide. DegreeCentrality works with undirected graphs, directed graphs, multigraphs, and mixed graphs. DegreeCentrality returns a list of non-negative integers ("degree centralities") that are particular centrality measures of the vertices of a graph. 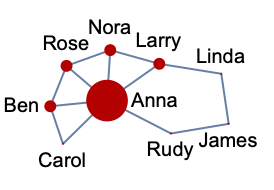 Degree centrality is a measure of the centrality of a node in a network and is defined as the number of edges (including self-loops) that lead into or out of the node. Degree centralities therefore lie between and inclusive, where is the number of vertices in a graph, and identify nodes in the network by their influence on other nodes in their immediate neighborhood. This measure has found applications in social networks, transportation, biology, and the social sciences. A second argument "In" or "Out" can be used to give a list of vertex in- or out-degrees, respectively, which correspond to one another for undirected graphs. DegreeCentrality is a local measure that is equivalent to VertexDegree for simple graphs. Similar centrality measures include EigenvectorCentrality and KatzCentrality.